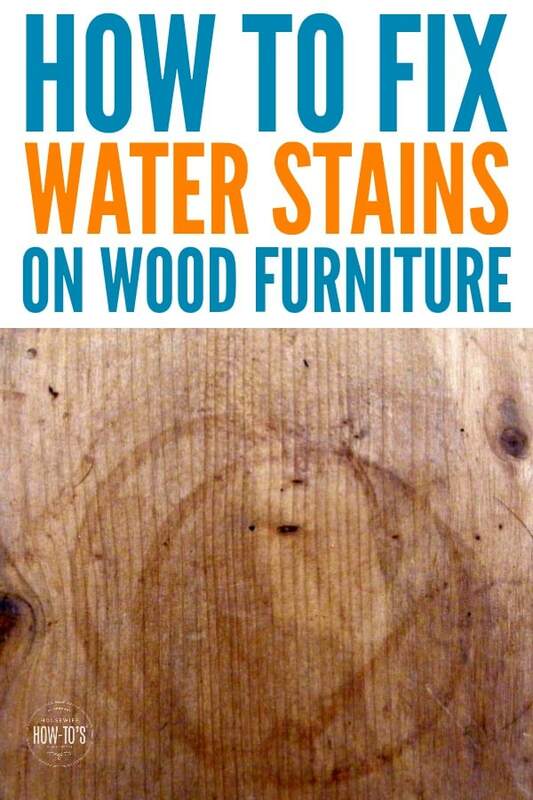 Today’s Reader Question concerns how to fix water stains on wood, and whether it’s possible to get rid of oil stains on wood, too. I have two questions. My husband put a hot coffee cup on our wooden bedside table, and it has left a white mark that I can’t get off. Any suggestions? Also, oil marks from a coconut oil bottle have stained my vanity table. I desperately want to fix this because it was my great grandmother’s vanity table/mirror made by my great-grandfather. I love your Facebook page, by the way! It’s fantastic! 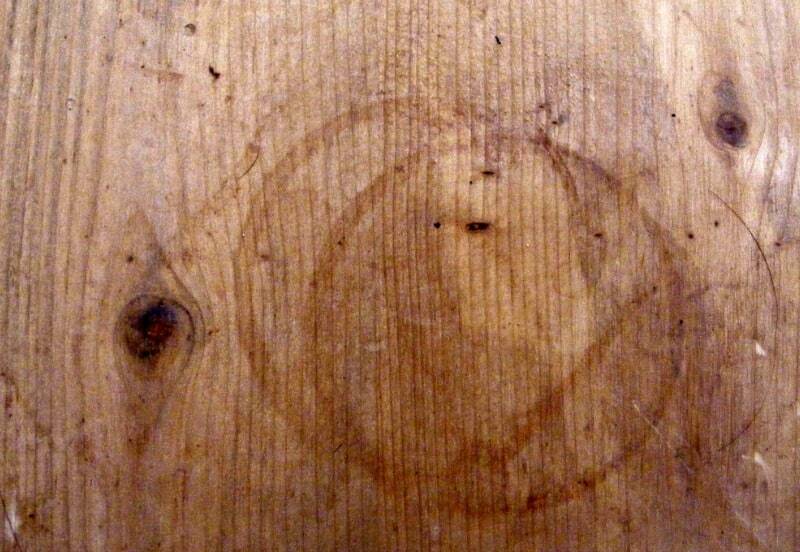 When dealing with water or oil stains on wood, we fix them by using the opposite stuff. So, to remove water rings we’ll use something oil-based, and to remove oil stains, we’ll use something water-based. And sometimes we need to use heat, so be sure to read these instructions in their entirety before trying them out. Wipe the surface with a dry microfiber cloth to remove any dust and debris. Using a corner of the cloth, work mayo or oil onto the ring. Rub it in, and take care not to get it on non-hazy spots. Place the plastic wrap over the mayo and let this sit overnight. The next day, wipe the mayo or oil off with a warm, damp microfiber cloth. Rinse and repeat until the greasy film is gone. Buff the area with a dry lint-free cloth. If the ring is still there, you’ll want to try the heat-based method below. It is essential that you follow these instructions precisely or you may damage your furniture. I’ve used this with great success — just be sure to watch the timer! This process uses the heat of an iron to transfer the water stain’s moisture from the wood to dry cloths. Layer both towels over the stain and press down with a hot iron using NO STEAM for 15-20 seconds. Lift the towels, check the stain, and repeat if needed. Counteract the oil with a water-based solution like the one below. Mix the oxygenated bleach into the warm water. Using the corner of a microfiber cloth, wipe the water mixture onto the oil stain. Do NOT saturate the area, or you’ll just create a water stain. Use the soft bristled brush to work the oxygenated solution into the stain. Wipe with a dry cloth and repeat the steps as necessary until the stain is gone. It’s not hard to fix water stains on wood, or even oil spots, so I always recommend giving these methods a try before going to all of the trouble of sanding. I hate sanding. If they’re still visible after using a refinisher, they’re probably oil stains. I was trying to clean a “my little steamer” and I filled it half water half distilled white vinegar. Then somehow when the solution boiled or perhaps before it came out. I’d blame the cats but it might be my fault for not watching it or over-filling it. Now there’s a big stain on a chest made of cedar. I tried dish soap and water and scrubbed with two different brushes as well rags and paper towels but that didn’t work. Is there any way to fix this or will it have to be sanded and polished again or something? Thanks for any help. Try the oil-based approach. If that still doesn’t work then it does sound like you’ll need to sand, stain, and reapply varnish. Good luck! I oiled thé hinges our internal oak doors with johnson oil and it has stained one of the doors can you tell me how to fix this it looks unsightly. I can think of two ways that might remove the oil stains. I’d first try heating 1/2 cup of white vinegar, adding a few drops of Dawn dish detergent, and wiping that on the area while it’s still quite warm. Wait a minute or two, then wipe it away and let the area dry. If the discoloration remains, try making a paste of Oxiclean and warm water. Rub this firmly into the area and let it sit for a minute or two, then rinse it away with a damp cloth. Be sure you don’t saturate the area with either approach or you may create a water stain, too. How do you repair a table top that someone tried to press a tablecloth with a steam iron. It left a big white spot. Mike, try the oil-based solution in this entry. If that doesn’t fix it, you’ll need to sand and re-stain the area. This will be a very valuable post for LOTS of us! Thanks for giving us some insight. Hope things are well on your end, also with your dear husband.